HYPERWHEY provides premium quality whey protein to enhance your training at an optimally affordable cost. Whether you are streamlining your supplementation or new to the body-building lifestyle, whey is a simple but incredibly powerful nutrient source. Nutrabolics has engineered HYPERWHEY using a blend of Hydrolized Whey Peptides, Cross-Flow Microfiltered Whey Isolates, and Instantized Whey Protein Concentrate. These fine-filtered proteins are known for their potency and purity, and are free of extra fat and lactose. 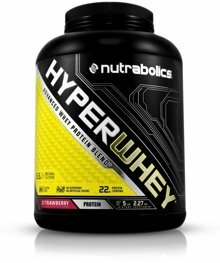 HOW ARE HYPERWHEY AND ISOBOLIC DIFFERENT? The difference between these 2 supplements represents the different needs various athletes and bodybuilders have. ISOBOLIC contains a sustained-release triple isolate protein matrix that feeds your muscles in stages over 8 hours - perfect for heavy bodybuilders who essentially never want to slow down their anabolic processes. Other athletes are on very specific diets/training schedules and prefer rapidly digested dosages of high BV protein to instantly boost post-training recovery. With HYPERWHEY we've taken one of the premium protein isolates used in ISOBOLIC and perfected it to provide this instant dose of high-value protein, making it a simpler but equally powerful supplement.